I believe that Art and Music are universal languages. Both build bridges and unite across cultures and around the globe. Music has always been a part of my life and has always been entwined with my art. Jazz greats like Miles Davis, Maynard Ferguson, Sonny Rollins, Claude Nougaro, and Herbie Hancock generally accompany me in my studio. Sometimes, I’ll be creating to Rock or Blues, the Beatles or Funky music, but overall, my rhythm syncs with the heart of Jazz. Those jazz roots, some 45 years ingrained, are what makes the most recent collision of my work with classical stringed instruments all the more intriguing to me. Dreams became reality. Up until last year, my exposure to classical music has been minimal. 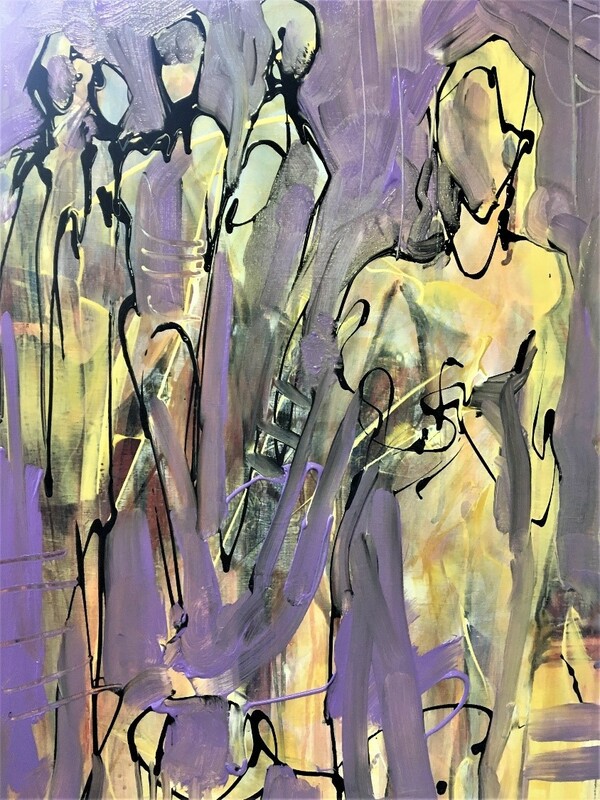 Then, on 6 June 2018 during my solo exhibition at Maryland Hall, three musicians created live structured improvisational works inspired by individual pieces of my exhibited artwork. As Rogue Collective musicians (Alexa Cantalupo, Natalie Spehar, Kaitlin Moreno) moved through the Gallery finding their next art focal piece, their unique brand of classical music filled the rooms, lifting our hearts. Guests were transported as the musicians simultaneously created and played live, improvising new works titled identical to the piece of art that intrigued them. My dream and my Creative Collaboration Initiative “Every Painting is a Song (EPIAS)” was a natural evolution for me in terms of my personal journey. This short video will clearly explain my concept. 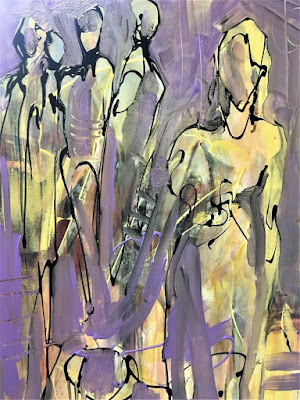 To date, we do not yet have music videos of each piece, but Rogue Collective created music to the following a) Paintings - Talking Story, Chance Encounters, The Gathering – Still Waiting, Mirror, Mirror, and b) Sculpture - Resurrection. 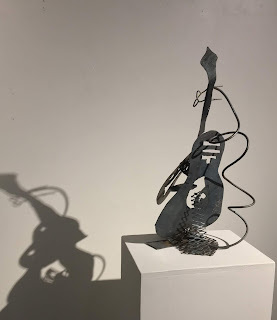 To find out more about how music has taken me in new directions and inspired a new sculpture series "Visual Acoustics," I invite you to read my recently published article "The Music in Me" on the Blog Live An Artful Life! Be sure to subscribe so you never miss one of their creative and positive articles. How does music and art inspire YOU? To close for now... I do not know what music genre this will fall into, but following is a first stanza or chorus of a song I am writing... My days of self-limiting are behind me! Take the leap of faith with me and fear no art! “Every Painting Is A Song (EPIAS)” - Explaining the Creative Collaboration Initiative. 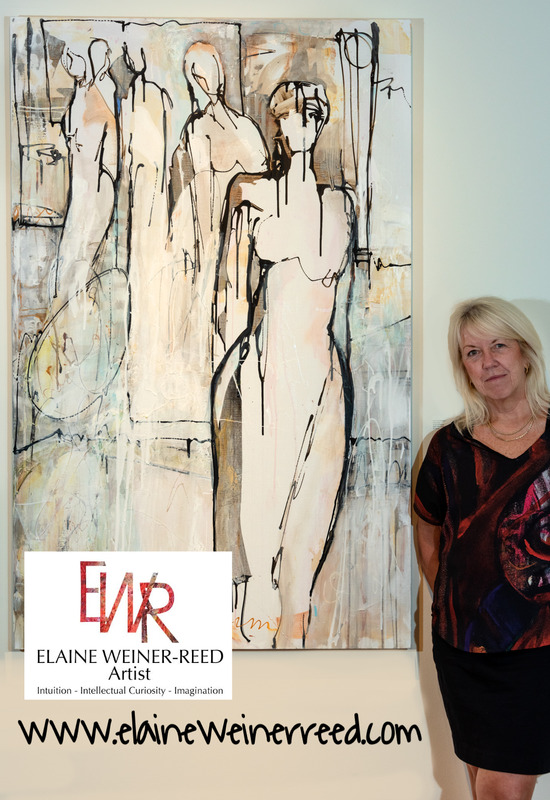 “Chance Encounters” – Art by Elaine Weiner-Reed. Music by Rogue Collective. 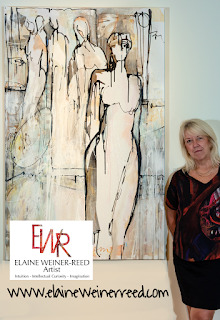 “The Gathering – Still Waiting (Judgment Day)” – Art by Elaine Weiner-Reed. Music by Rogue Collective. Yours in Art...and now, Music!